Thanksgiving Is No Longer Thanksgiving Without Julie’s Sweet Potato Soufflé! Last night was the annual Fulbright Thanksgiving dinner. It was the nicest, warmest, hospitable evening and the most delicious Thanksgiving dinner that I’ve ever had. Thanks to the efforts of Alain, Iman, the staff, and I’m sure Alain’s wife Kathy Sullivan, it couldn’t have been a nicer evening. Alain welcomed us and made us feel at home before we headed off to the next room to fill our plates. All the Fulbrighter’s were asked to prepare and bring their favorite dish. The main meal spread was outlandishly beautiful and tasty, and three long tables were covered with deserts. Amira and I worked late yesterday. She wasn’t being picked up until seven o’clock to go home, so she accompanied me to the dinner. It was her very first Thanksgiving dinner. 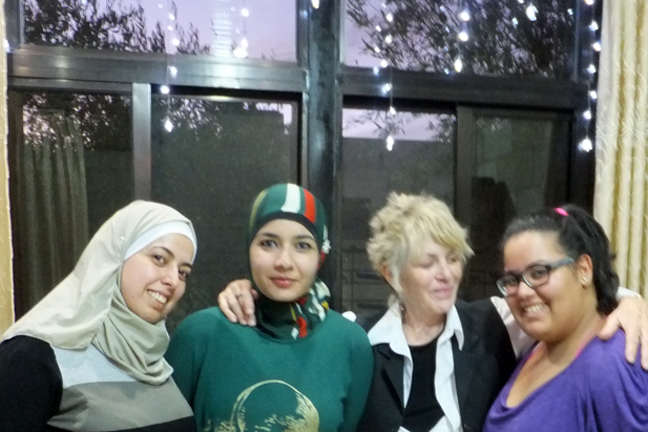 I sat at a table with Nehal, her mother Saleema, Amira, Claire, and a newly employed office assistant and her friend. Claire, Nehal and myself were the only one’s at our table who had experienced a Thanksgiving dinner before. I made sure that everyone at our table ate some of Julie’s absolutely fantastically delicious sweet potato soufflé. I have never tasted such scrumptious sweet potato’s before. I also made sure that the Thanksgiving “newbies” at my table ate cranberries, pumpkin pie and pecan pie. What is Thanksgiving without those foods? Without them it isn’t a true thanksgiving feast. The “newbies” said they had never tasted anything so scrumptious. The company and food were a delight for all of us. Thank you Alain, Iman, the staff, and Alain’s wife Kathy Sullivan for the best and happiest Thanksgiving of my life! Since moving into my apartment, I’ve been working on the Seven Women’s House Keys canvas daily, about 10-12 hours per day. My concern throughout the creation of this canvas has been not having enough time to complete it before the exhibition date, January 8th. 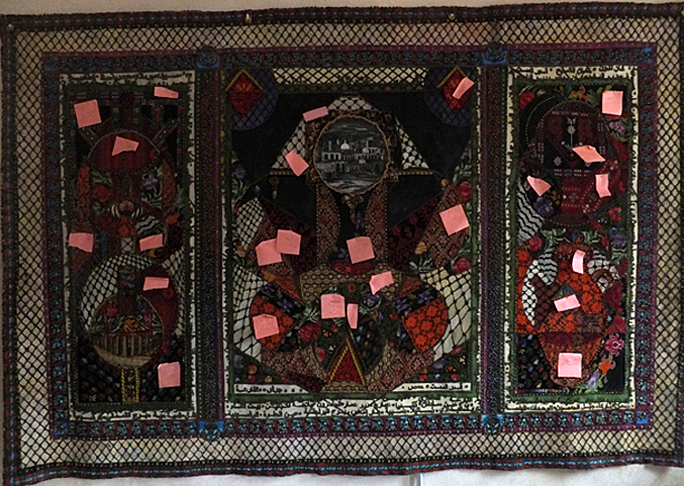 Haneen’s “sign” that she’s in the right place, and similar “signs” that others have told me in relation to this project, help me to remember my reason for being here: to create a canvas that incorporates embroidery from various Palestinian villages. The purpose of the completed canvas is to visually integrate fragments of Palestinian heritage (symbolized by the embroidery patterns) and their direct relationship to the ownership of land and homes in Palestine. One evening Dayala, Hanan’s neice, came over to bead. While we were beading we talked about the fact that many Palestinians in Jordan still have the deeds to their homes and land in Palestine. I decided it would be a good idea to incorporate a copy of a deed printed on cotton into the canvas. Dayala volunteered to copy her father’s deed on cotton. She reappeared the following week with the deed on cotton. The only problem was that the deed was printed as a decal on fabric, which caused a sheen to the fabric. Hanan sanded the decal but, even with sanding, the fabric retained a sheen and was incongruent with the embroidery appliqués on the canvas. 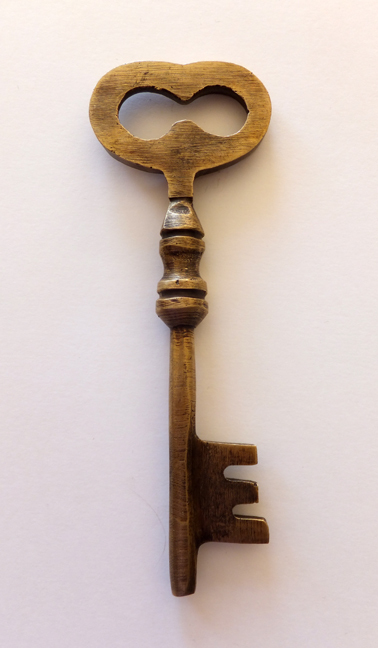 Many Palestinians were forced from their homes in the middle of the night and left with only the key to their front door. They were told they could return to their homes in a week or two. Many of the older women living in Jordan still wear their house key on a chain around their neck underneath their clothing. 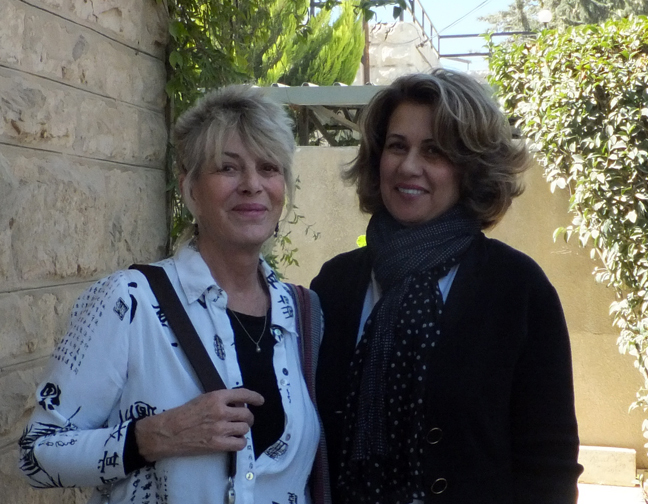 I chose to come to Jordan because there are millions of dispossessed Palestinians here, many of whom were born here. I’ve found that the younger generation (35 years old or younger) are not educated about their history and unaware of the current events in Palestine. Association with Palestinian identity in Jordan means exclusion from government jobs, equating to an exclusion from economic advancement. 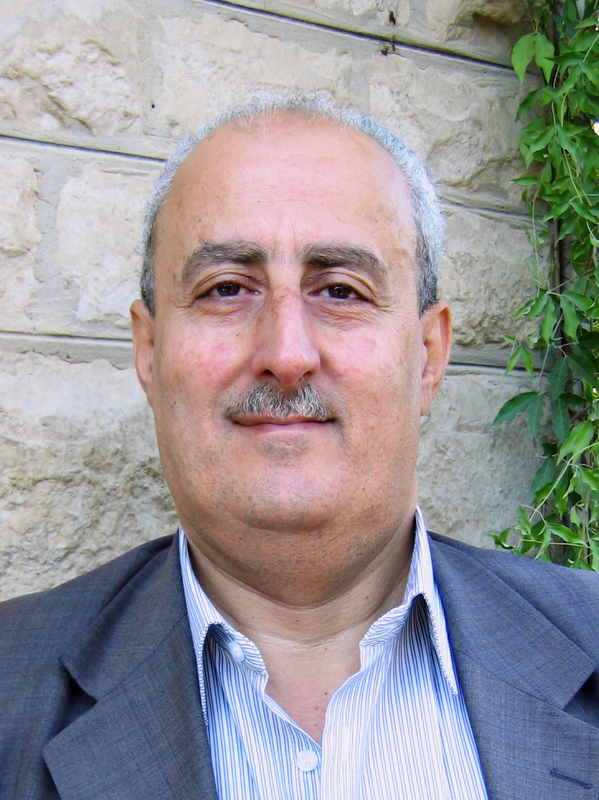 In general, advancement requires establishing Jordanian identity, primarily through marriage (children acquire their father’s last name, the wife keeps her maiden name). It is a very complicated issue, but suffice it to say, the younger generation’s lack of interest in their “lot in life” is disconcerting. Palestine is so close, yet so far away. The lights of Palestine are visible from the coast of the Dead Sea, a two hour drive from Amman. My original intent was to meet with seven Palestinian women on a regular basis and have them assist in creating the canvas. 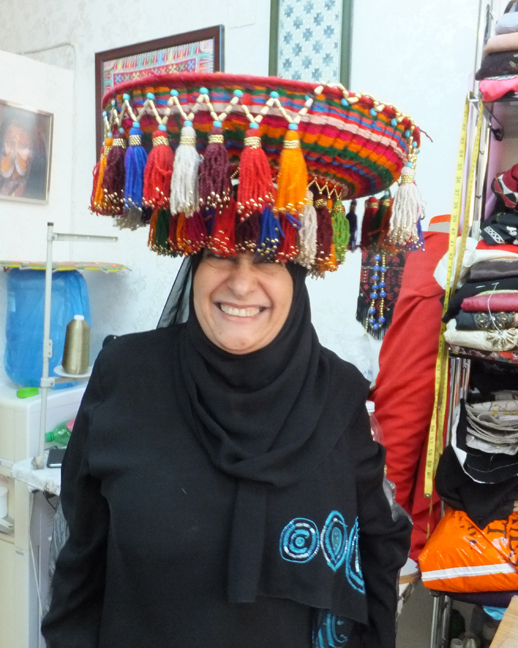 Not long after arriving in Jordan, I was referred by a friend to a man who–I was told–had ties with embroiderers in Amman. I met only twice with the group of women this man selected, in my apartment. I disbanded this group after being informed he was mismanaging the funds and the project. I removed the work the women did on the canvas and started again from scratch. 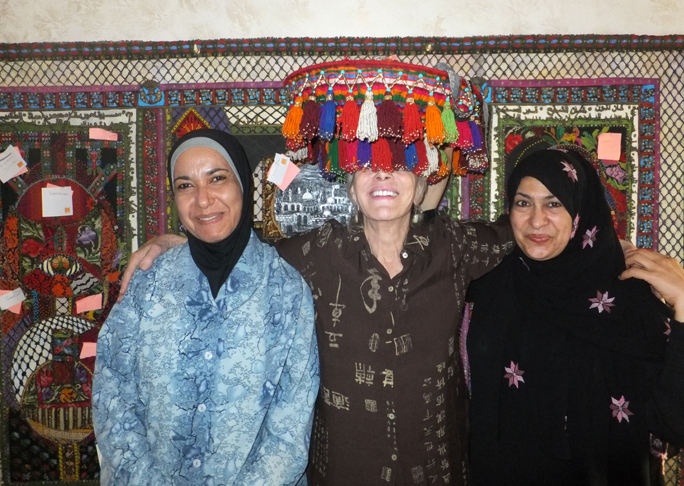 I then established a new group of women with the help of Hanan Khalidi, the artist I met immediately after arriving in Jordan. 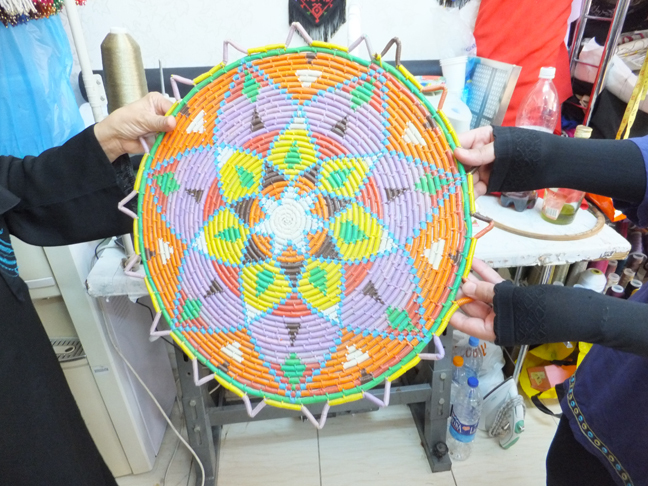 I included one woman from the original group, Majedah (see earlier post), and five women embroiderers recommended by Hanan. My time for working on the canvas was shortened by over a month, therefore, the role of the women embroiderers changed from actual work on the canvas to meeting twice for a salon at which time they beaded and embroidered sections of the canvas and shared their ‘stories” of how they ended up in Jordan. Their “stories” have been my inspiration while working on this canvas. The pillars of the salon participants have been Hanan (with occasional visits from her female family members), Majedah and myself. 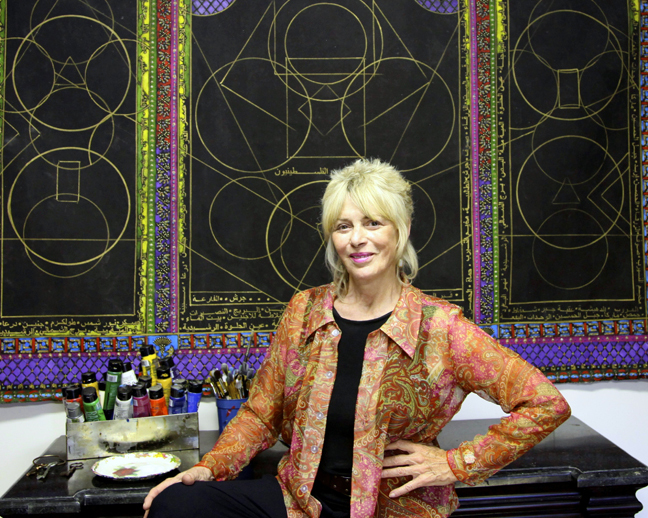 The biggest contributor to the canvas has been Hanan. She donated her collection of yokes of women’s dresses that she and her sisters embroidered over the years to use as appliqués on the canvas. 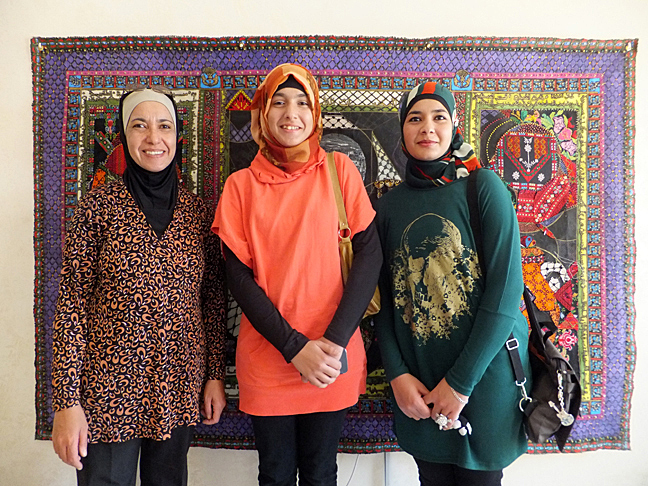 Without Hanan’s artistic and embroidery contributions the canvas could not exist. Hanan spent numerous hours building up the impasto on her painting of Jerusalem, the central image on the canvas, and crocheting around it. 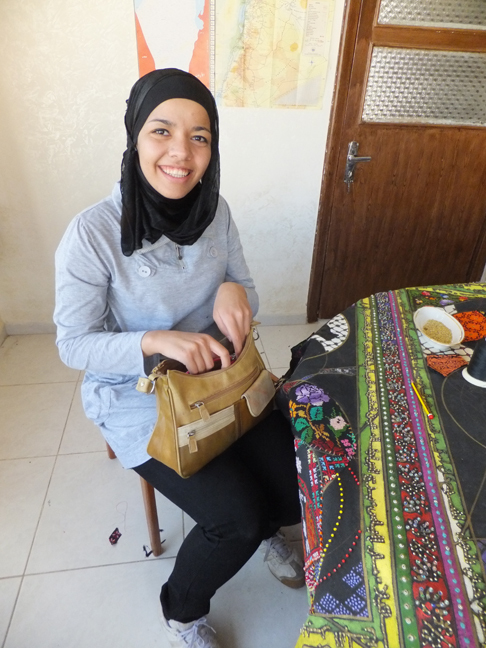 Hanan showed up weekly with additional contemporary embroidery appliqués that she created inbetween our meetings (the olive branches, the central diamond shape on the pitcher and some other embroidery). 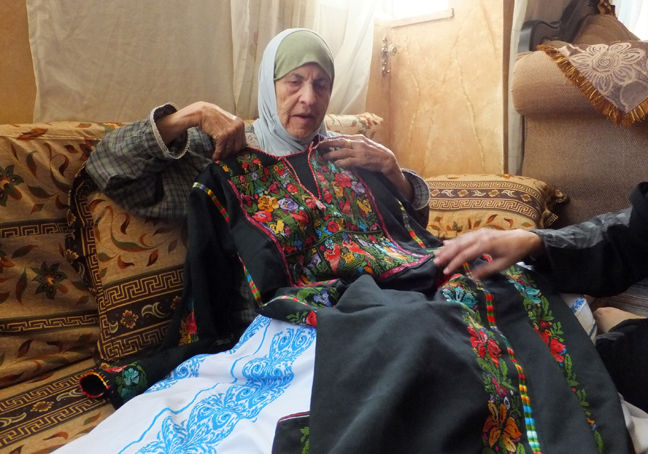 She usually arrived with her daughter Amira and at least one other daughter to assist with sewing seed beads on the names of the Palestinian refugee camps written around the border. Amira and I usually spent our salon time working together on details and transactions (phone calls) pertaining to the exhibition and scheduling meetings. 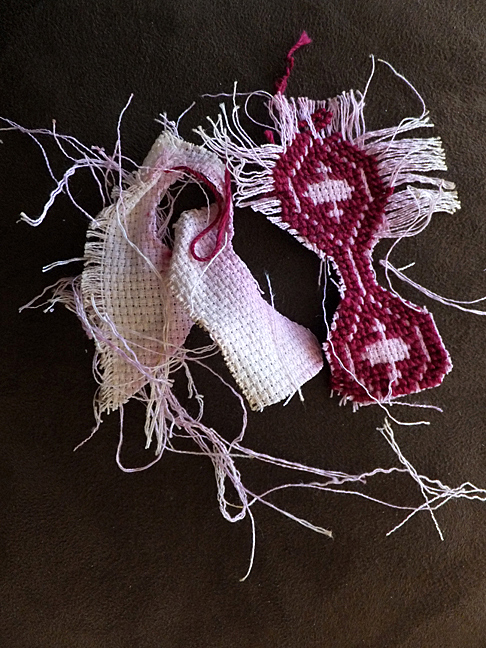 Hanan demonstrated the way to create Palestinian embroidery, by transferring a cross hatch pattern on paper to fabric, the stitching technique and removal of the threads. Majedah also participated in our group meetings. 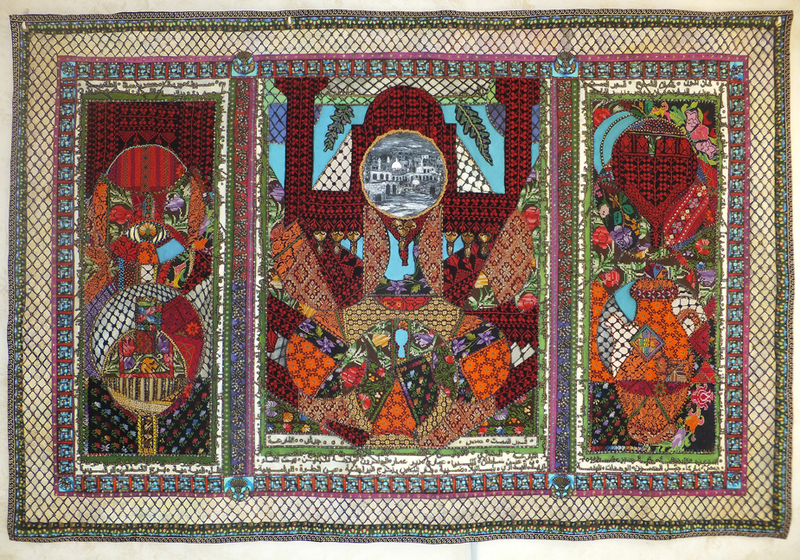 Majedah’s family home is in Gaza and she contributed several appliqués representative of Gaza and the yards of embroidered trim for the border of the canvas. 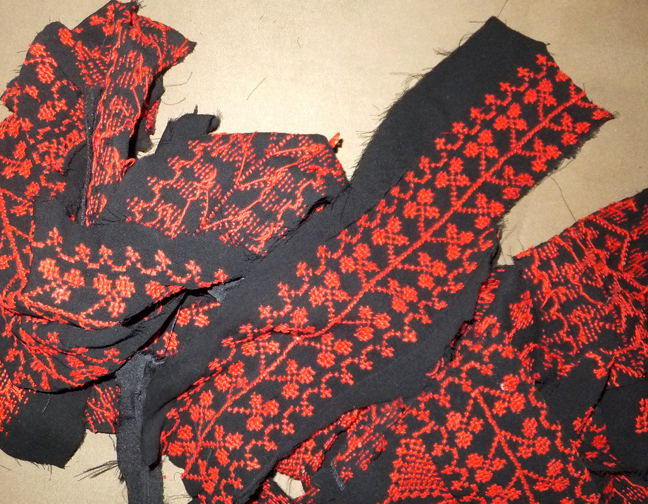 Majedah also provided an abundance of historical and technical information related to Palestinian embroidery. 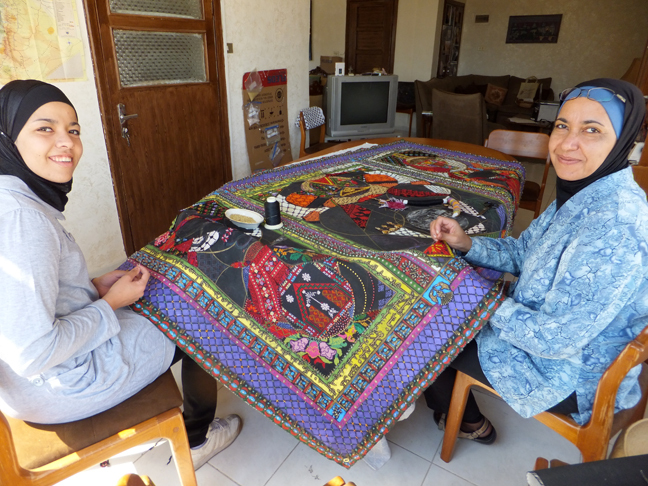 During my last meeting with Majedah, Hanan and her two daughters Rasha and Amira, we labeled the sections of embroidery appliqués with the names of their respective village. …and playing around some more! At one point, when the canvas was nearly completed, the man whom I had originally employed to find the women embroiderers threatened to sue for stealing intellectual property and actually made claims that the project was his idea. His claims were beyond ridiculous and would never hold up in court, but to avoid further association I tore off the two appliqués that were originally purchased (with my money) to be used on the canvas. After the appliqués were removed, the composition of the canvas needed to be changed, which was at first disconcerting. I personally learned through this experience that our calamity is our providence. To tie the composition together I needed large areas of embroidered appliqués. 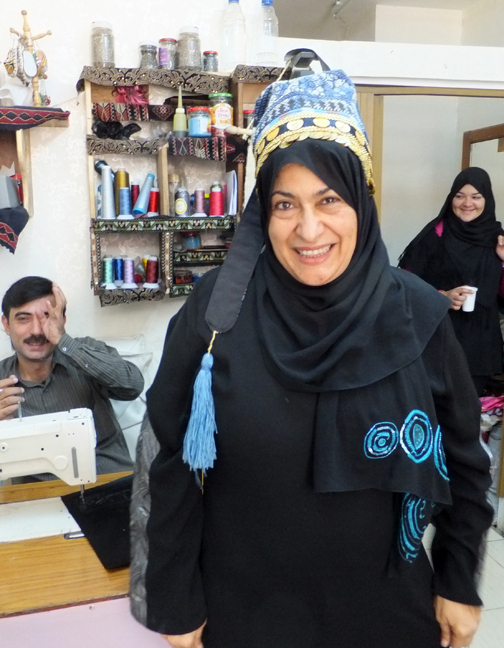 Soon after I first arrived in Amman, I purchased a truly beautiful hand-embroidered Palestinian dress with red and black threads. I was looking forward to wearing it to the upcoming Fulbright Thanksgiving dinner but, alas, I cut it up to use on the canvas. Now the canvas, through my eyes, finally says what i want it to. The central painting of Jerusalem is surrounded by appliqués from the dress that speak to the Dome of the Rock in Jerusalem and minarets. 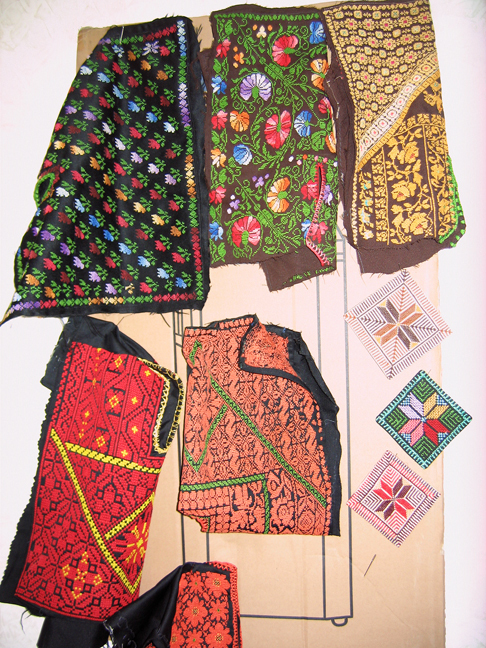 The energy and intellect of many people contributed to the creation of the canvas: their stories about Palestine, their knowledge and first hand experience, and their thoughts while sewing, all contributed to a gorgeous, historic collection of embroidery that captures the beauty and memories of life in Palestine. Et, voilà! Un fait accompli! Every month I need to renew my visa. Renewing my visa requires taking a cab to the Fulbright House. I have no idea where anything is in Jordan, including the Fulbright House. Luckily, some of the cab drivers do, and even luckier for me, some of them speak English. Arriving at the Fulbright House is similar to homing pigeons returning home. I get to see my proxy guardians: Alain McNamara (Executive Director), Iman Abdul-Wahid (Program Director), Mohammad Al Ahmad (Accountant) and Sayel Asakreh (Driver). Alain, the all-aware protector of all the Fulbrighters, keeps us all on track and in one piece. Iman makes sure we all have a decent place to live, and once we’re situated that our needs are met. 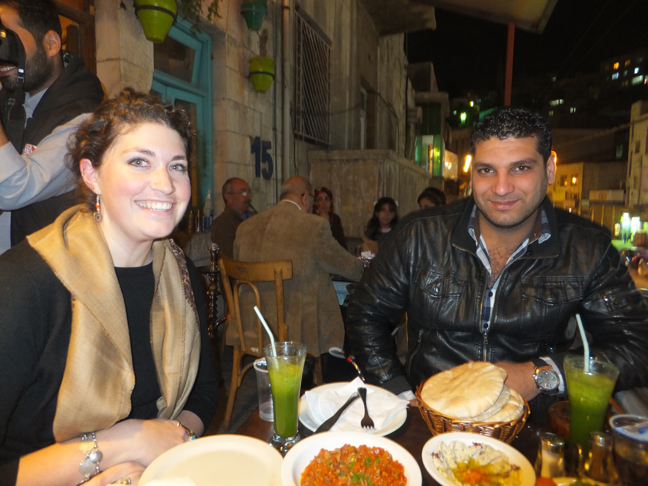 Mohammad makes sure we get our stipends so we can pay our taxi fares and buy food. And Sayel makes sure we don’t get kicked out of Jordan by taking us to the Police Station to renew our visas. 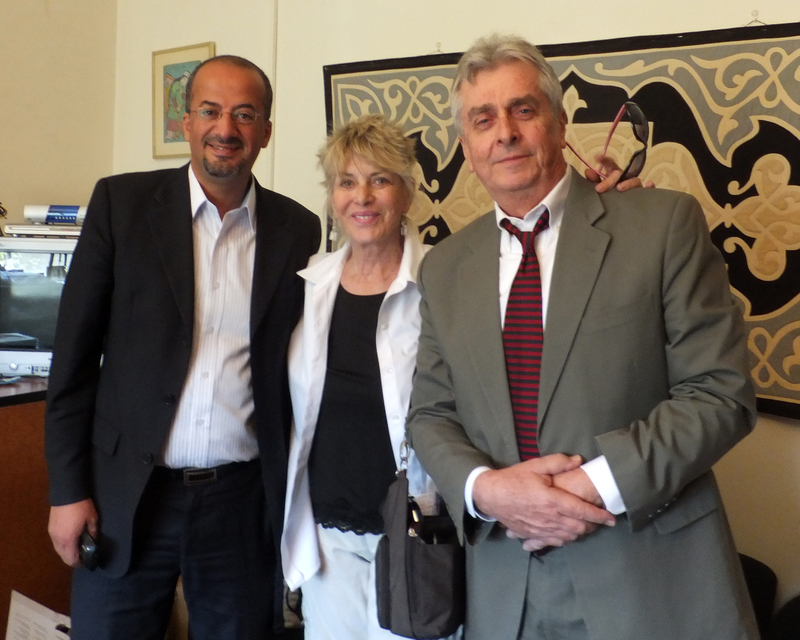 On one occasion during a visit to the Fulbright House Abdalrahem Alarjan, a well known photographer, met with Alain to discuss the application procedure for a Fulbright Scholar Award. 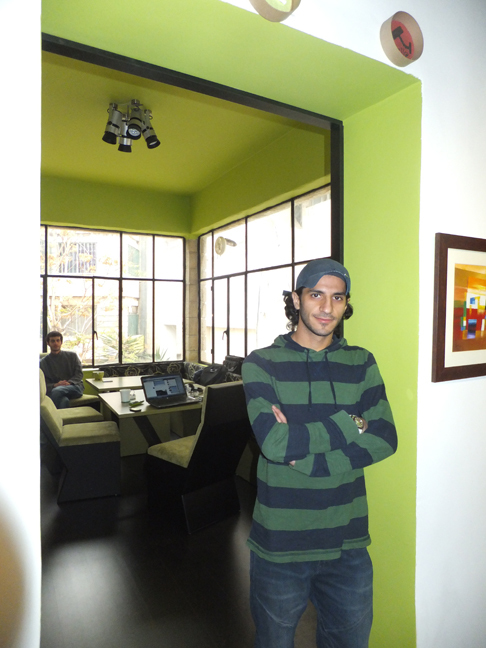 Abdalrahem Alarjan is one of the seven artists who will be showing their work in the Seven Women’s House Keys show. 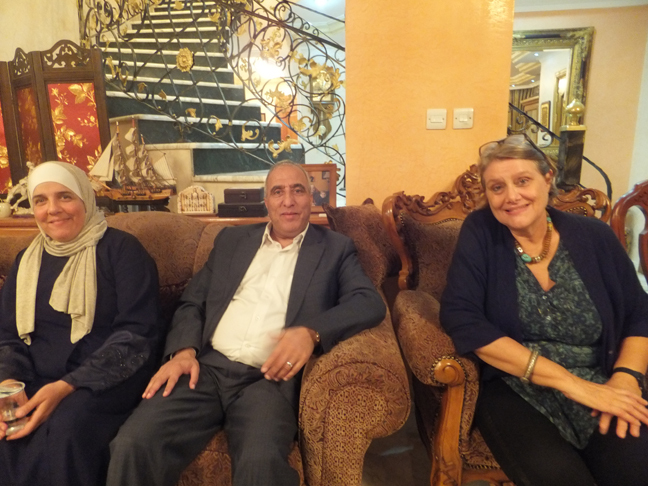 Once a year Dr. Nidal Younes and Dr. Abla Al-Bsoul host a dinner to honor the Fulbright scholars in their beautiful home in Shafa Badran, an area outside of the city. (The only glitch in the entire evening was that the photographs I took of Nidal, our host, were too blurry to use on this blog). 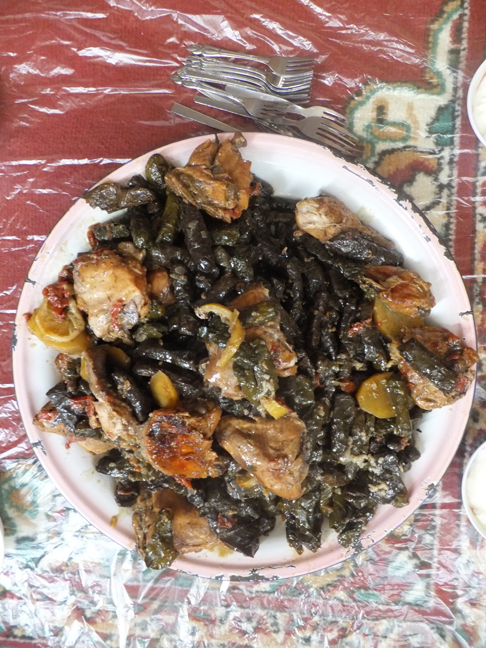 Abla prepared a spectacular feast. Their home is gorgeous and the conversation with the scholars, faculty and administrators of universities and guests was stimulating and enjoyable. 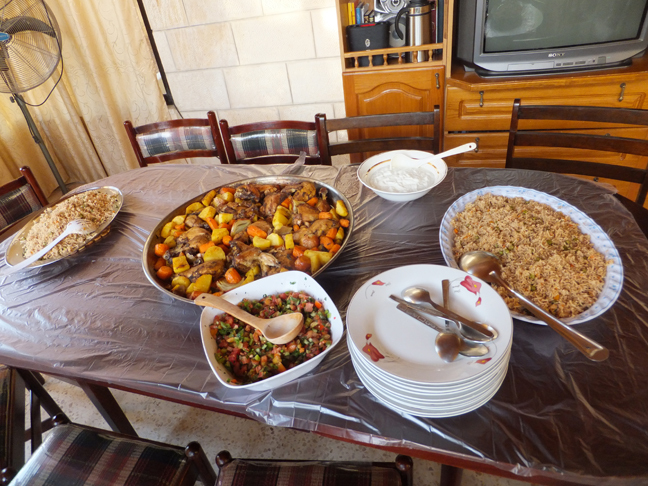 Soon after this wonderful evening, Nehal Abu-Lail (a Fulbright Scholar from Washington State University in Pullman, Washington) hosted a dinner for the scholars in her home in Irbid, located near the Syrian border. Nehal and her mother cooked the feast, which was delicious, and it was a very enjoyable afternoon. We had the opportunity to meet her wonderful family. (The only glitch was that the battery in my camera needed recharging; therefore, I only have one blurry picture of the event). Christina Gordon, a Fulbright Student from Washington D.C., and I shared a cab when renewing our visas. She’s teaching English at the Modern Educational Academy, a private school, located in the seventh circle. I volunteered to teach a class in lettering to her junior high students. I demonstrated printing their names (in English and Arabic) and creating bubble letters. (The only glitch was that the cab driver was late picking me up, which made me arrive ten minutes late and the class was only forty minutes long). I absolutely do not like being late to anything, so I eliminated that cab driver and hope to have better luck with another one. The other night Christina, Ibraheem and I went downtown to see the Roman Steps and eat dinner nearby. It’s a gorgeous area in the day time but it is even more gorgeous at night. (The only glitch in the evening was that I lost my trusty Guatemalan carry-all bag that I’ve used during my travels for twenty years. Nothing was in it except a bottle of hair conditioner I bought before going out, but I will most certainly miss my bag)! 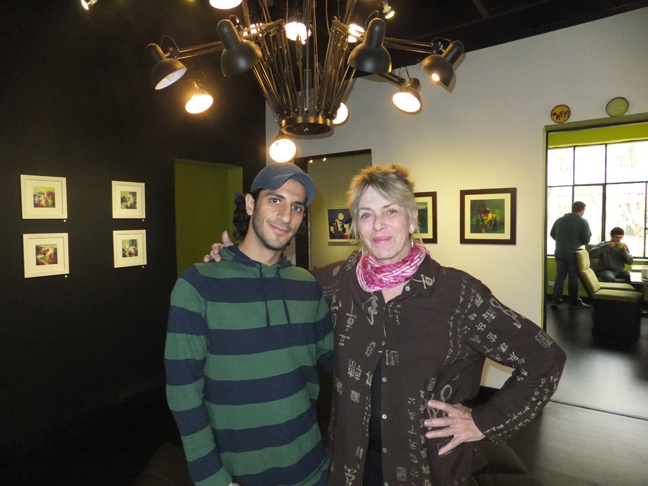 A couple shop spaces from Ibraheem’s flower shop is Khaled Homsi’s Young Eye Gallery. 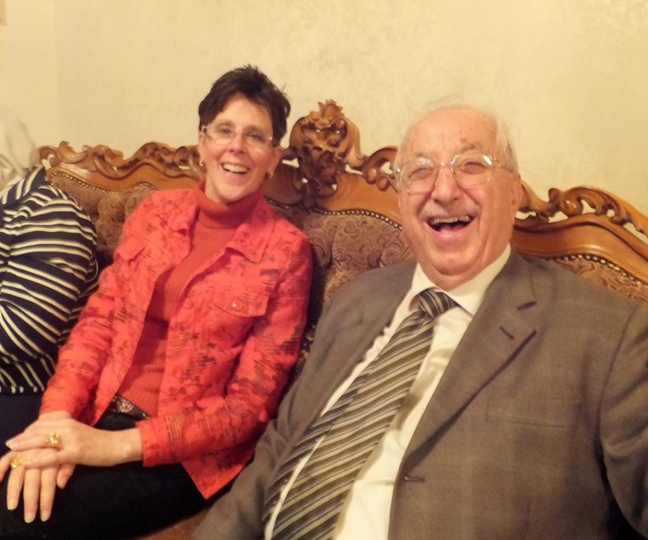 Shortly after arriving in Jordan I met Khaled Homsi. 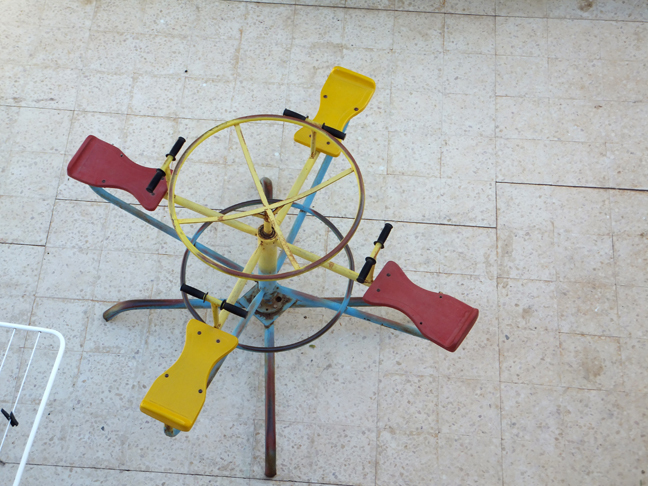 Until a few months ago Khaled had a design business in Syria. 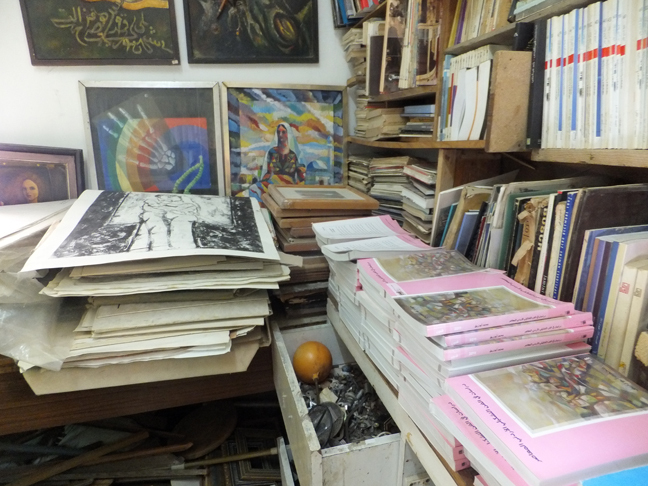 After his place of business there was bombed, he moved to Jordan and opened an art gallery in Paris Circle. 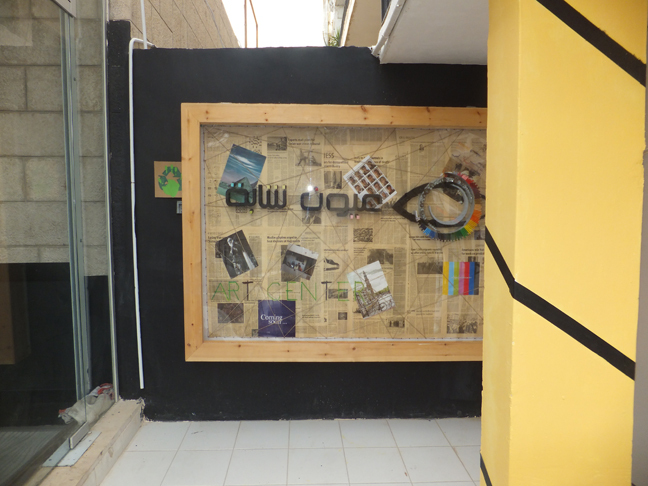 When I first saw Khaled’s gallery in September it was a gutted portion of a building. He told me he had great plans for the space and the renovation would be completed in October. It is absolutely magnificent. I am considering adopting him, not that he needs it. He is 27 years old and has wonderful parents. My thoughts are that if I adopted him I could have him design my house as payment for being my son. 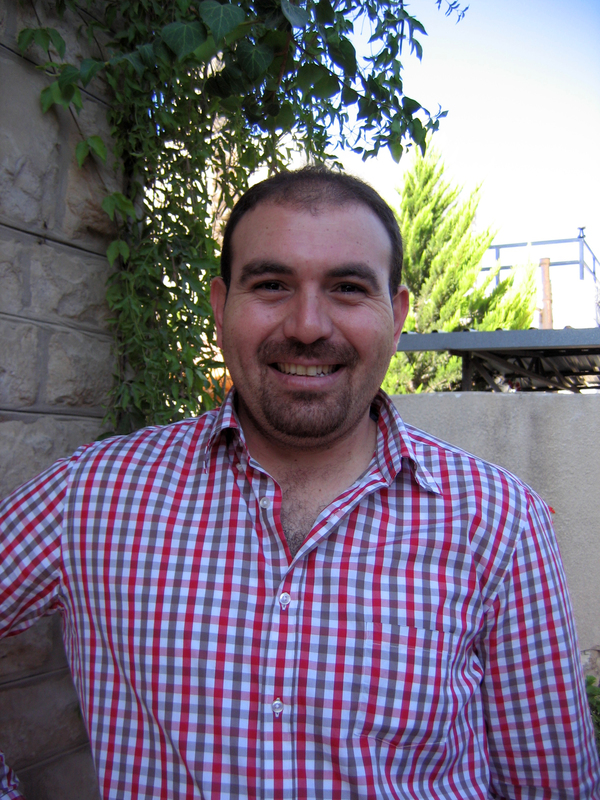 Khaled’s passion is working with recycled materials and cleaning up the environment. When he lived in Syria he formed a volunteer organization that cleaned up waterways, lakes and rivers. Ultimately over a thousand people took part in the cleanup, men, women and children. 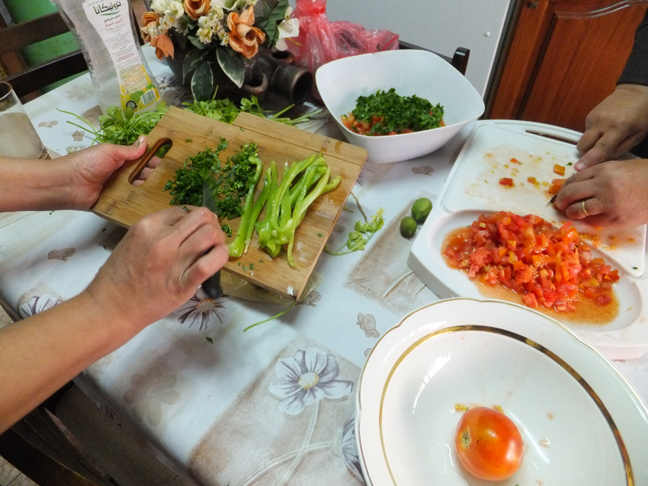 On Eid (October 15), I was invited to Hanan’s brother’s house for dinner. They live near the airport in what is considered the countryside, away from the hustle and bustle of the city. 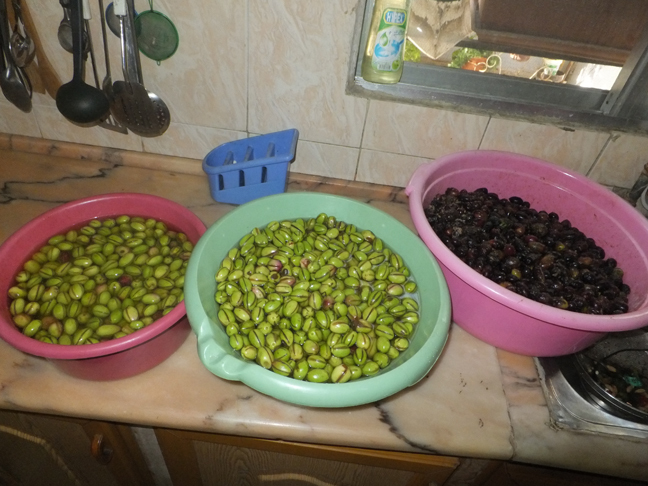 Mamoud’s wife Dalal and daughters Deyala and Dima helped prepare the festivities and meal. 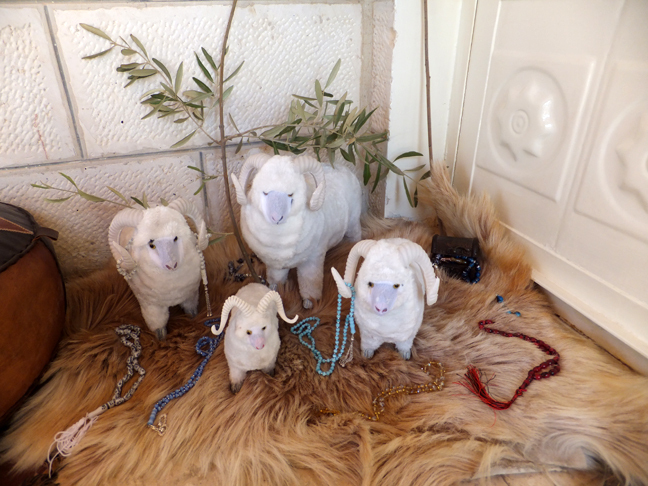 Dima decorated a corner of the entry room with miniature stuffed sheep and necklaces displayed on a sheep skin. Sheep play an important role during the five days of Eid. People who can afford to buy a live sheep (approximately 300 JD) purchase one or two the night before Eid from one of the temporary corrals set up on the highway access roads and in town. The sheep are butchered on the spot and packaged. The meat is handed out to the poor during the five days of Eid when they knock on the gift giver’s door. Eid is the time of year when family members and good friends visit each other’s homes and partake in meals and sweets. 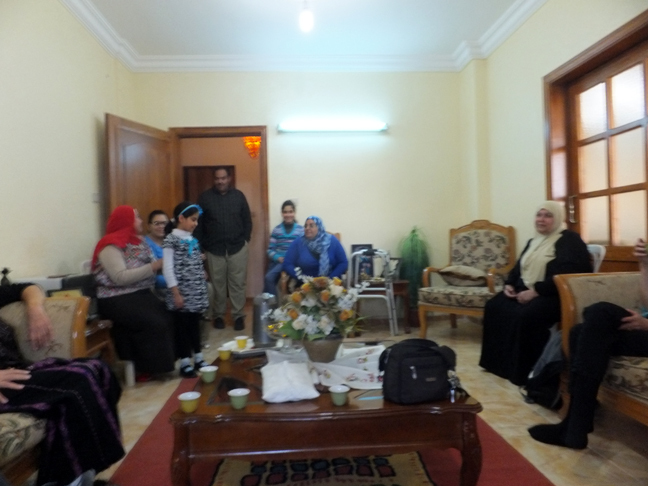 On the first day of Eid I was a grateful guest at the Mamoud Khalidi home. Mamoud prepared the upside down chicken and showed it to me before it was popped into the oven. Dima, Mamoud and Dala’s daughter, placed a basket filled with her handmade jewelry on the coffee table and asked me to choose two pairs of earrings as a gift from her. 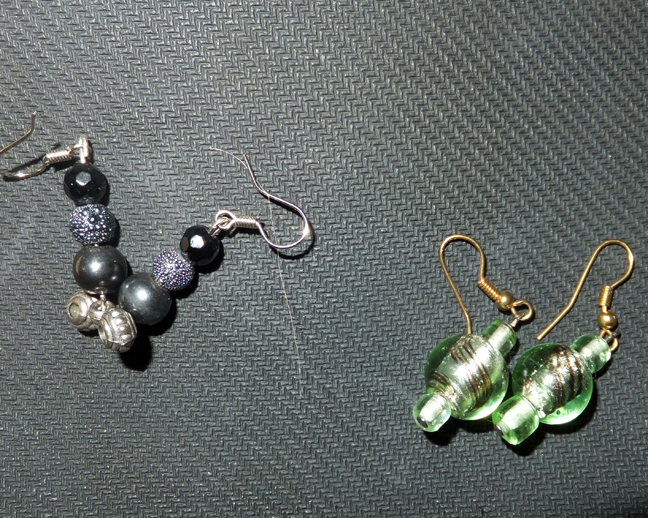 I gladly accepted and chose a beautiful pair of blown glass dangles and a beaded pair of earrings with magnets. After putting on the magnet earrings I immediately felt more centered. I obviously needed to stabilize my magnetic field. To celebrate my newly found center, Dima made me a cup of American coffee. The coffee was a real treat, I’ve been drinking primarily Turkish coffee since arriving in Jordan. 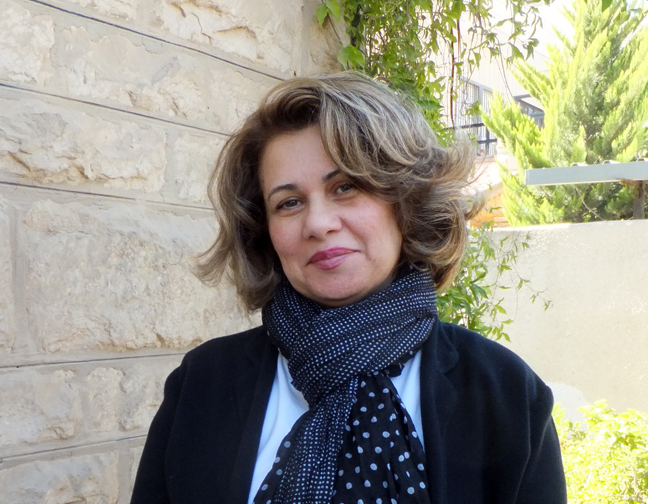 Deyala, Mamoud’s and Dala’s eldest daughter, is an architect and works for the architect Riad Anlkiswaini in Amman. Dima wanted to show me the view from the rooftop. 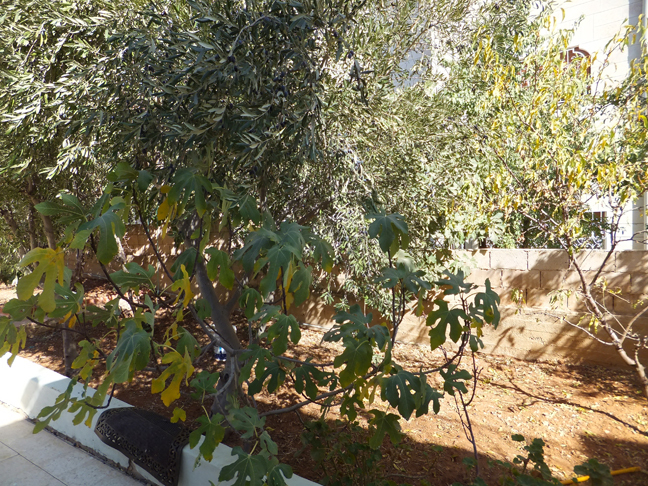 On the way to the stairs to the rooftop Dima pointed out their olive tree and childhood swing. After viewing our surroundings from the roof we sat down to a scrumptious dinner of upside down chicken with vegetables, salads and yogurt followed by Turkish coffee. After drinking the coffee we topped the evening off with assorted candies and hot sweet tea. 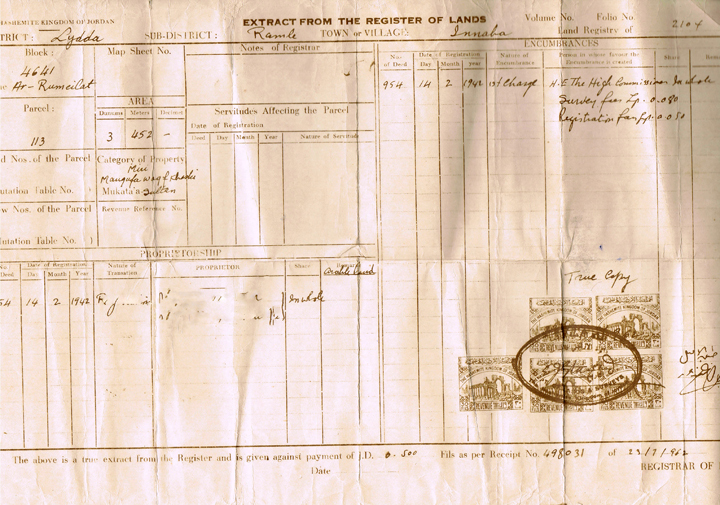 Mamoud showed me a copy of the deed to his home and land in Palestine. 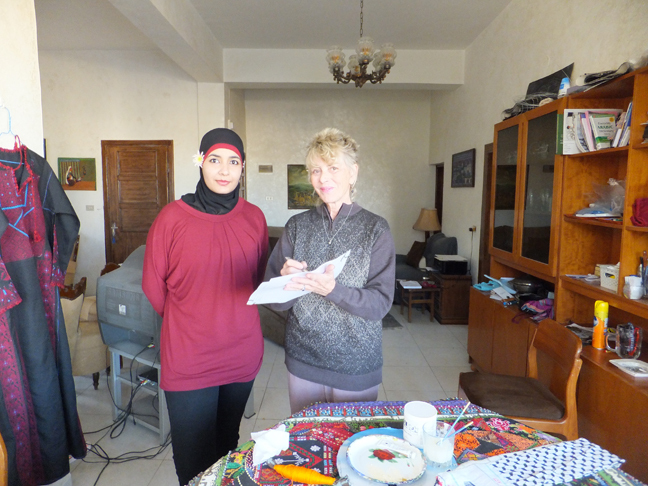 Many of the Palestinians I’ve met still have the deeds to their homes in Palestine. Many also have the key to the front door of their house in a Palestinian village and are waiting to return. After bidding our goodbyes, we got in Hanan’s car and headed back to the city. 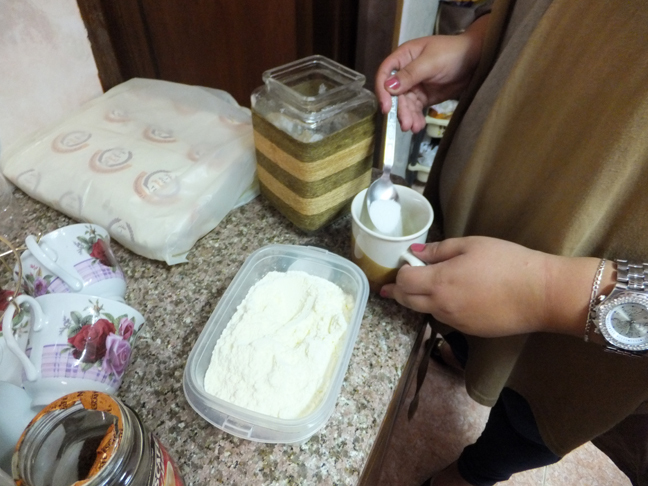 During the Eid holiday, Hanan invited me to join her while she printed a flax plate at Mohammad Abu Zraiq’s studio. Hanan is creating prints with images of a key hole and keys for the upcoming Seven Women’s House Keys exhibition at Artisana Gallery 14, January 8, 2014. 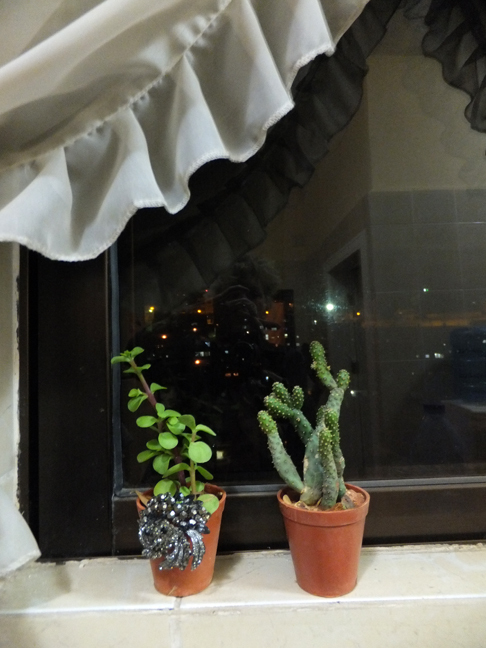 After returning to my apartment I brewed a cup of American coffee while looking at the plants and broach on my kitchen window sill, gifts from Hanan and Amira, thoughtful tokens of friendship. 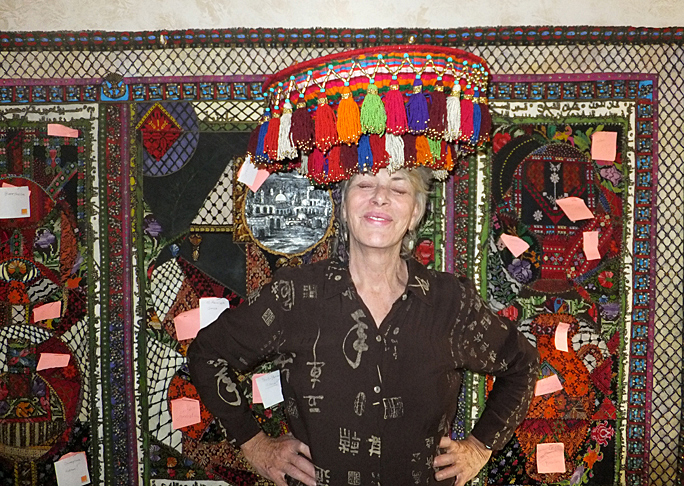 The following is a photo of Majedah wearing her unique design of a wedding hat. Traditionally the hat is made of woven hay. 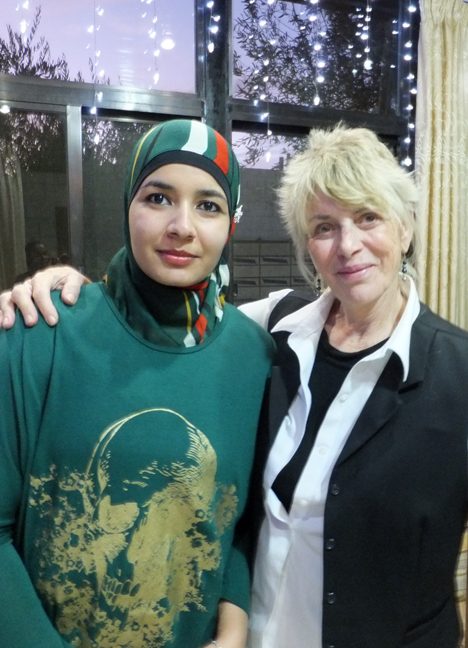 After placing the wedding plate on top of her head, Majedah talked about the “Emily Post Etiquette” of traditional Palestinian weddings. The night before the wedding is called “Henna night.” Henna night is dedicated to decorating the bride with henna designs by a henna expert who accompanies the mother, aunt or sister of the groom and carries a large tray on her head filled with henna, flowers, candles, green branches, sugar, tea, coffee, chewing gum, nuts, and chocolate. The henna expert applies designs on the bride’s hands, feet, arms and one leg. 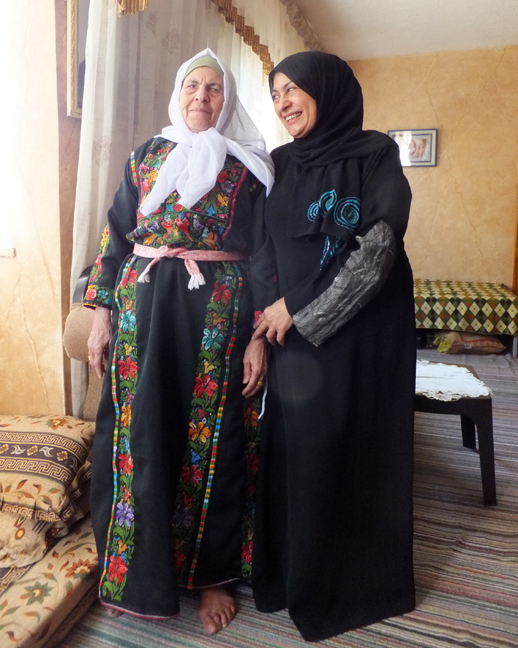 Majedah described the activities at a traditional Palestinian wedding, “The ladies dance with the bride. The unmarried girls pinch the bride while she is dancing for good luck, in hopes that they will marry soon. The wedding dress dance is comprised of dancing in front of the women while wearing a procession of seven dresses: white first, then red, green, pink, blue, beige and, lastly, black (symbolizing a bedouin). While wearing the black dress, she dances with her palm extended upward and the attendees put money in her hand. On the afternoon prior to a wedding, a dinner is held under a tent for the groom, his male friends and the male family members of the bride and groom. After the dinner, the men form a procession and walk to the bride’s house carrying the groom on their shoulders. If the bride lives far away from the groom the groom is propped on top of a vehicle and driven to her house surrounded by cheering males. 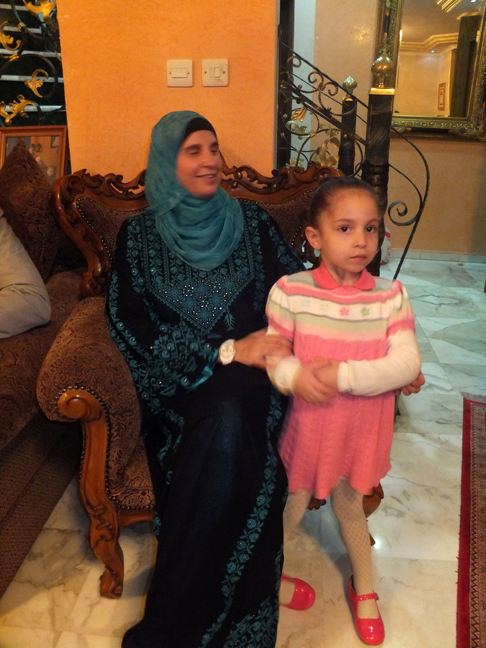 In 1948 Zainab’s family was forced to leave their home in Gaza during the war. Afraid of the approaching soldiers, they left at night carrying only the key to their house and the clothes they were wearing. They had been told that they would be able to return to their house in a week or two. When Zainab was twelve years old, a sixty-three year old man who was a friend of her father asked for permission to marry her. Her father agreed. The marriage lasted for five years, during which time she gave birth to two boys. Her husband died and she was widowed at the age of seventeen. Remembering her first marriage brought tears to her eyes and she was very upset, describing her marriage as a period of her life when she was very unhappy. After the death of her husband, her children were taken away by her husband’s family. Eventually she re-married, this time to her cousin, 3 years older than she was. In time, her second husband became her best friend and her most beloved. During her second marriage she was happily married and lived in Jericho. In Jericho the United Nations provided food, tents, clothes and some clay shelters in the refugee camps. She stayed in Jericho for 12 years, until 1967, at which time they were forced to move again, this time to another country, Jordan. Zainab had 3 sons and 4 daughters from her second marriage. When they arrived in Jordan they lived in Al-Karama camp for a week. Because it was over populated, they moved to Al-Husayn camp in Amman where they lived in tents. Zainab’s daughter, Majedah, talked about her school in the camp. It was a tent and in the winter the rain flooded the dirt floor and it was extremely cold. Zainab added that prior to 1967 the men living in Jericho used to travel to Jordan to work and then return to Jericho. It is nearly impossible now for Palestinians who were forced out of Palestine in 1967 to get permission to reenter, even on a tourist visa. 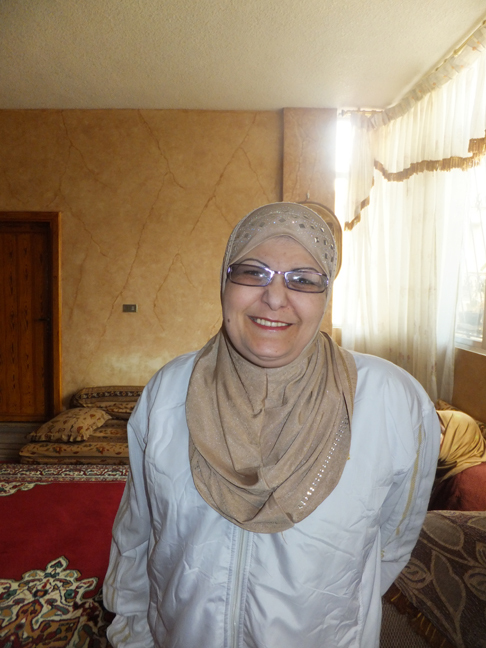 Zainab has visited Palestine three times since being forced from her home in 1967: in 1999, 2005 and she can’t remember when the third visit was. 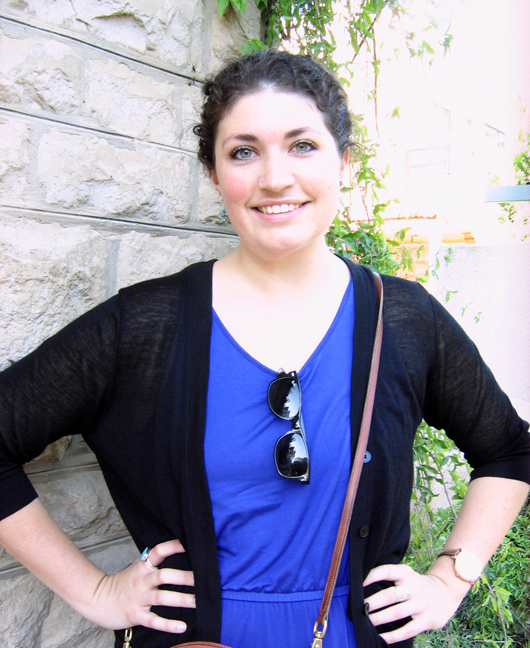 She said that she went to Jerusalem, Ramallah, Hebron, and Jenin on a limited tourist visa. When asked about her life in Palestine, she described the weather and said they did not use refrigerators even in the summer because the weather was so cool and the air was so clean. She talked about the life-supporting nature of the trees, foliage, wild flowers and herbs and that the villages lived off of what they grew and the animals they raised. She related how dresses were made and embroidered in the past: “A group of women would sit together and sew on a dress for 45 days.” The group embroidery sessions were an important component of the women’s lives and they took great pride in their workmanship. She said the ukaiah, a traditional head piece trimmed in gold coins, was made and worn by women, and some women put a coin on their chest as a measure of good luck.